Hungary offers a wide variety of programmes for visitors of all generations arriving either with their families or on their own. The range of activities includes extreme sports and quiet bicycle tours, as well as visiting castle ruins, exhibitions of modern arts or thermal spas and aquaparks. The lovers of water can spend their holidays at one of the huge lakes, Lake Balaton and Lake Tisza or can choose one of the several rivers including the Danube or the Rába. Apart from these, several other small and large lakes rich in fish and with crystal clear water await visitors: the fish pond of Dunaföldvár, the protected group of lakes in Biharugra or Small Balaton. The lovers of water sports can go rowing on the Danube or the Tisza, while some sections of the Bodrog and the Rába are even suitable for rafting, too. On Lake Tisza, which was created by damming the river, you can enjoy jet-skiing and sailing. The lake offers other special experiences including the bird reserve which you can see - among other things - from a parachute drawn by a boat on the lake. At Lake Balaton you can go sailing on the huge surface of the lake, or you can take part in a special event traditionally held in August where you can swim across the lake between Tihany and Szántód being situated nearly 2km from each other. Taking part in a cruise you can enjoy the monadnocks in the Badacsony hills, the high parts of the Balaton Highlands, the hills surrounding Siófok or the innumerable beaches and tiny bays from Keszthely to Balatonfüred. The innumerable beaches and baths are offered for not only families with children, but also for health-conscious visitors. Hungary has a number of spa springs yet to be exploited, but several aquaparks have been built on some of them including the bath in Hajdúszoboszló or Zalakaros which has been well-known for decades, or the one in Mogyoród awaiting visitors with water chutes and wild water. 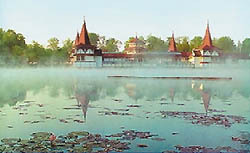 Lake Hévíz, which is the largest hot water lake in Europe, is especially beneficial for locomotor diseases. In Gyula you can enjoy the bath in the neighbourhood of the castle, while in Egerszalók you can find a bath hidden at the foot of the hillside covered by huge pine trees and offering outdoor pools in winter and in summer. The baths in Harkány, Zalakaros and Kehidakustány have had regular visitors for years. Apart from waters, visitors are offered innumerable bicycle roads in the country: you can ride a bicycle around Lake Balaton or in the Great Hungarian Plain, but if you prefer mountain biking, several slopes are suitable for this sport in the hills. Hikers can enjoy the untouched hills of the Bakony or the Northern range of hills including the Bükk, Mátra and Zemplén hills, where you can take short or long tours in the forests. From the look-out towers built on the hill-tops you can enjoy the beautiful view of the region: in Kékestető you can find the highest point of Hungary, while the look-out tower in Írottkő overlooks two countries. From the top of János hill you can enjoy the view of Budapest, the Barbakán overlooks the city of Pécs, while from the Avas look-out tower there is a beautiful panorama of Miskolc. From the site of the transmission tower of Tokaj you can see as far as the Great Hungarian Plain and the Zemplén hills, but if you do not like climbing, you can go up to Magas-hegy (High hill) near Sátoraljaújhely by a chairlift. Apart from sports and relaxation, you must not forget about the cultural values: the relics of the past centuries can be found all over the country. In the Great Plain you can still find people living in farms far from the towns, dealing with agriculture and breeding Hungarian grey cattle. In Bugac-puszta horse shows are held regularly, while in Hortobágy you can try the typical speciality of the region, the goulash soup, for instance in the inn next to the Nine-arch Bridge. Hortobágy is part of the World Heritage due to its natural values and traditions, as well as the Old village of Hollókő in county Nógrád, where not only the houses reflecting the characteristics of folk architecture have preserved traditions, but also the inhabitants, as well. One of the folk traditions is the sprinkling on Easter Monday, an attraction not-to-be-missed, when the boys wearing national costumes chase the girls and water them with a bucket of water. The main avenue of Budapest lying on the banks of the Danube is Andrássy road, which can be found in the heart of the city along with the promenade along the Danube and Buda Castle. The edifices built at the turn of the 19th and 20th centuries have preserved their splendour. From the Castle you can enjoy the view of the neo-classical Parliament situated on the opposite bank of the river. There is a beautiful view of the buildings of Pest from the Fishermen's Bastion as well as from Gellért hill. 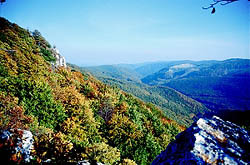 A unique natural beauty is the Aggtelek Karst, which is also part of the World Heritage. It includes the longest cave of Hungary, the 25km long Baradla. In the caves you can see several million-year-old dripstones of unique shapes reflected by the names of the formations such as the Giants' hall, the Mother-in-law's tongue or the Hall of Columns. 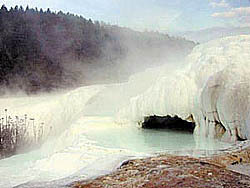 Apart from walking around the caves, you can enjoy concerts here, held in this special scenery. In Cave Béke the air is suitable for treating respiratory diseases. In the east of Hungary it is worth visiting the historical wine region of Tokaj. The famous aszú of Tokaj is made of the grapes grown on the slopes of Kopasz-hegy (Bald hill), which is situated at the junction of the rivers Bodrog and Tisza. You can try other delicious wines such as furmint and olaszrizling grown in the other parts of the wine region stretching from Sárospatak to Tarcal. The historical relics are worth visiting in the region, too, including the synagogue of Mád, the Great Library of the Calvinist College of Sárospatak or the castles hidden in the Zemplén hills, in Regéc and in Boldogkő. Lake Fertő hidden in the north-western corner of the country is not only a paradise for birds. The region with saline, boggy areas and thick reeds has been inhabited for eight thousand years. The most beautiful city of the region is Sopron with its baroque civic houses, but the Esterházy Palace of Fertőd and the former home of Széchenyi in Nagycenk are also worth visiting. Visitors must not miss Pannonhalma situated in the south of the region: the buildings of the one thousand-year-old Benedictine Abbey reflect the elements of baroque, neo-classical, Renaissance and Gothic styles. In its archives the first record written in Hungarian language is preserved. Near the southern border, in Pécs you can also find buildings which are parts of the World Heritage: the Peter-Paul Burial Chamber and the Wine pitcher Burial Chamber are the most beautiful relics of Early Christianity. The city, which is situated at the foot of the Mecsek hills, is also famous for its Turkish mosque and basilica, as well as its Mediterranean atmosphere.